I have been trying to bake my own bread since some times now. In my previous attempts i got Okayish breads, where some of the part was nice and as a bread should be and some of the part was un-cooked in centre. Finally, yesterday i was able to bake a bread that was uniformly cooked. 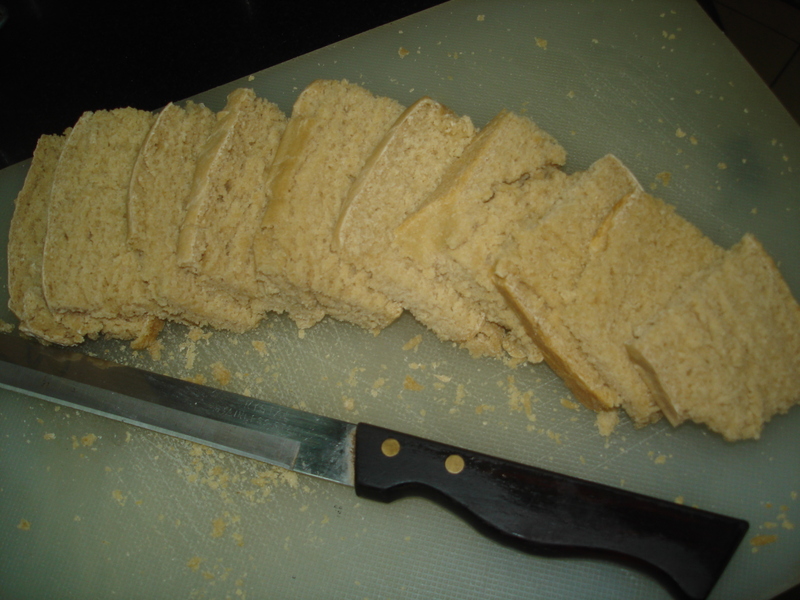 Though in my excitement to cut it, i couldn’t wait for the bread to cool down and ended up breaking some slices…But still it was a good bread, the way a brown bread should be!!!! Jumping to recipe now. I am following a recipe from Baby and toddler cookbook from Tarla Dalal with little modification (from Good housekeeping magazine’s recipe section). I want to mention here that i didn’t have a bread baking tin (Actually i bought one but it was a little big for my oven and didn’t fit in 🙁 ), so i kept the loaf in my regular circular tin and used aluminium foil to cover the bottom and sides of the loaf. But it is always better to use to bread baking tin for better results. 1) Take 1/2 cup warm water and add sugar to it. Mix well. 2) Now add yeast to this water and see that it dissolves completely. 4) Sieve the flour along with salt. Add butter and mix well. 5) Now using the yeast, sugar, water mixture, knead soft dough. If needed add some more warm water. 6) Knead well till the dough is smooth and elastic. A lady in a youtube video suggested “slapping” the dough to see that it is elastic enough!!! 8) Once the dough doubles in size, punch it in the center (from the same lady in the youtube video) to remove any air. 9) Knead it again thoroughly. 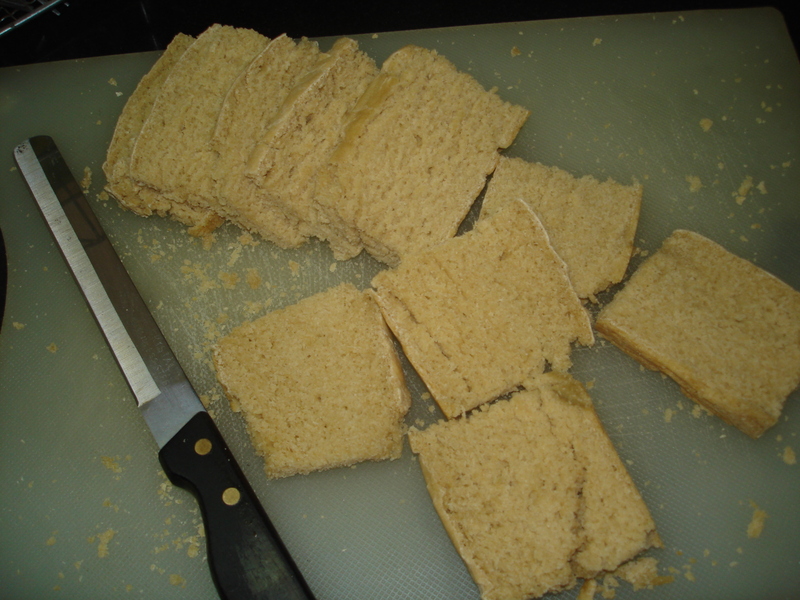 10) Shape into a loaf and place in the greased loaf tin. (as i said, i didn’t have any, so i kept the loaf in my regular circular tin and covered the loaf’s sides and bottom using aluminium foil. 11) Cover again with the damp muslin cloth and allow to prove again till it doubles in volume. Please, please let it cool before you cut it. 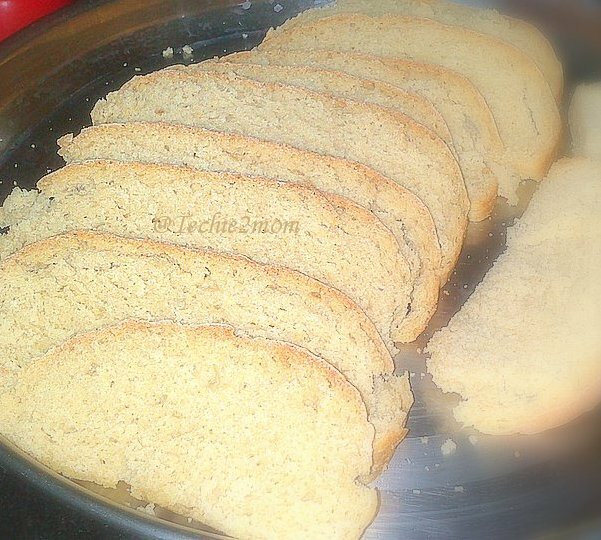 I know it is very difficult, but let it cool (you can enjoy the smell of the baked bread :)) and then only cut into slices.